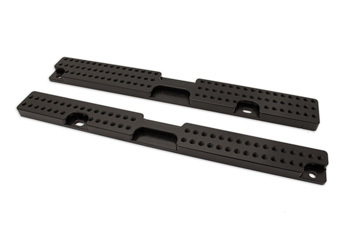 Other drivers of E9x BMW 3 Series have the ever popular VAC Motorsports Floor Mount Adapters. The Original and best; our CAD designed, thoroughly tested and CNC machined Billet Aluminum Floor Mount Adapters have been a best seller for years. Our FMA's allow the lowest and cleanest install of any seat brackets available. Hands down the best floor mount adapters available for your BMW, where form follows function. Our lightweight and improved design is a reflection of our commitment to offer the highest quality components available. While other copy-cat designs sacrifice weight, aesthetics, and driver/pasenger specific install to be cheap, our original FMA's allow you the perfect amount of adjustment for nearly any seat install without being cumbersome, heavy, or unsightly. Now, our FMAs are more affordable than ever! If you are installing 5 or 6 point harnesses; mount your eye-bolts right to our anti-sub mounting bracket. No more scraping, drilling or welding the floor pan. What do these allow me to use? Our Floor Mount Adapters allow you to mount Side Mounts from race seats, or Seat Sliders such as Sparco, Momo, or our VAC brand. They do not allow factory seats, or bottom mount seats to directly attach. Don't forget that we stock seat sliders, so just add them to the order if you need them! We strongly recommend adding our Superior Side Mount Adapters or purchasing them in together in our discounted Race Seat Installation Kit: They tend to fit much better than the seat manufactures side mounts in the tight floor pan and help you center your seat to the steering wheel. p>The Original and best; our CAD designed, thoroughly tested and CNC machined Billet Aluminum Floor Mount Adapters have been a best seller for years. Not for use with factory seats, or for bottom mount seats to directly attach. We strongly recommend adding our Superior Side Mount Adapters or purchasing them in together in our discounted Race Seat Installation Kit: They tend to fit much better than the seat manufactures side mounts in the tight floor pan and help you center your seat to the steering wheel.